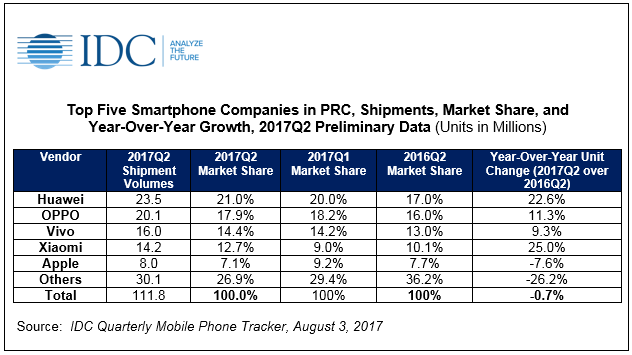 SINGAPORE, August 3rd, 2017 – The latest IDC Quarterly Mobile Phone Tracker reveals, 111.8 million smartphones were shipped to China in 2017Q2, and the year-on-year (YoY) growth was flat this quarter. After the extremely high 2016Q4 which saw OPPO, vivo and Huawei launching popular flagships that helped to drive replacement growth, the market has started to slow down. Reasons include leftover inventory from the previous quarter, as well as key flagships from OPPO and vivo being launched only towards the end of 2017Q2 and beginning of 2017Q3. Nevertheless, we expect smartphone shipments in 2017H2 to be higher than that of 2017H1 as companies such as Apple and other Chinese players push some of their flagship products that will help to drive some numbers. Apart from Huawei’s P10 which boosted shipment growth, its Honor branded phones continued to remain popular and made up more than half of Huawei’s overall shipments. The “6.18” event also helped to boost its sales; several Honor branded phones even made it to JD’s list of top 10 models during the sale. Despite it being the third shipping quarter of the R9s/R9s Plus, they continued to be popular models in the market and made up half of OPPO’s overall shipments in 2017Q2. It is also worthy of mention that though the R11 was launched only in mid-June, it managed to ship over 2 million phones within that short timeframe. OPPO’s aggressive marketing efforts continued to pay off, and its R11 will continue to be an extremely important model for OPPO in the coming quarters. Other than its outstanding camera, its curved edges that makes it easy to hold and use is well liked by consumers. Xiaomi rebounded and finally saw a YoY growth this quarter. It resolved the initial supply issues it had with its products and has increased its offline presence with more Mi Home stores now available in the market. It was also the top smartphone company that saw the most sales on JD.com during the “6.18” online sales in June. While Apple continued to see YoY decline in the market in 2017Q2, we believe there is a lot of pent up demand and anticipation for Apple’s 10-year anniversary iPhone which will be launched towards the end of the year. This will definitely help Apple see growth in China this year. The iPhone is still seen as a status symbol in China, where consumers are particular about using an iPhone to maintain their high-class image. With the iPhone 8 expected to look significantly different from the 7s series, along with significant changes to its specifications, we expect the iPhone 8 to be more popular than the 7s series. With the selfie culture continuing to be strong in China, more companies will start launching phones with dual front and rear cameras, and that could soon become the new minimum requirement for companies in China. More companies are starting to only highlight the strengths of their cameras through their marketing messages (e.g. OPPO and it’s ‘20MP front and back camera’ for its R11), and we expect this to be a key feature that companies will continue to focus on for the coming year, be it from the innovation or marketing standpoint. We expect the Android ASPs to continue to rise around 10% YoY in a year’s time. This is a reflection of a shift towards the higher end models as consumers seek to upgrade their phones with better quality and specifications. “With consumers seeking better experiences with their smartphones, we expect the mid-range (US$200<US$400) smartphone segment to gain a bigger share of the market across the next few years, as more users upgrade their phones. This will soon become the primary segment in China. Smartphone companies should focus on increasing most of their volumes from this segment, paying attention to specifications that are important to consumers such as processing speed, camera and battery life. They should also ensure that their phones are designed to look like premium models and are significantly different from previous iterations,” says Tay Xiaohan, Research Manager with IDC Asia/Pacific's Client Devices team.